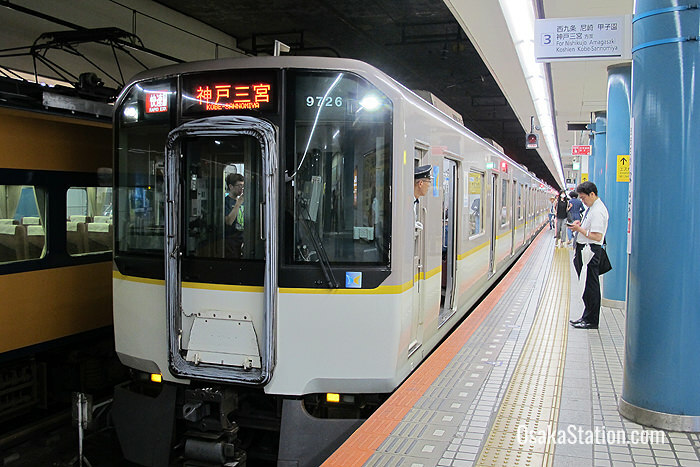 The Hanshin Namba Line is a private rail line operated by Hanshin Electric Railway that runs between Osaka Namba Station and Amagasaki Station in Hyogo Prefecture. Beyond Amagasaki Station many through trains continue traveling west on the Hanshin Main Line to Koshien and Kobe-Sannomiya. Traveling east from Osaka Namba Station many through train services also continue on the Kintetsu Nara Line to Kintetsu Nara Station. Effectively this means that this line provides an important link between the three cities of Nara, Osaka, and Kobe. Because the Hanshin Namba Line is a private railway, this line is not covered by the Japan Rail Pass. However there are alternative discount passes that we will examine at the end of this article. 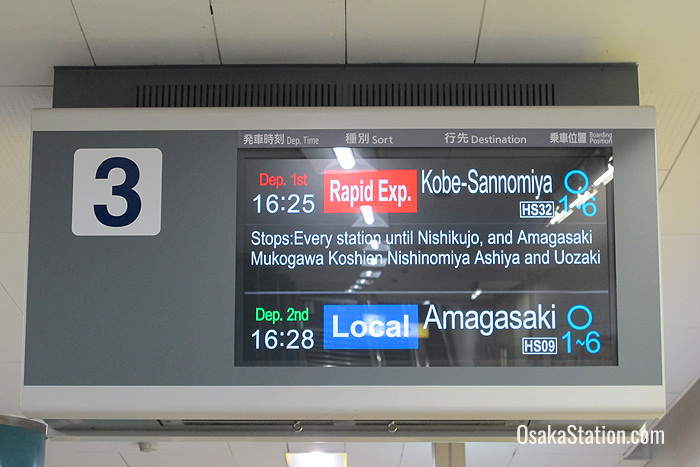 The key destinations and transfer points are given below with fares and train times from Osaka Namba Station. Details of through services for both Kobe and Nara are also given below. Namba is one of Osaka’s major shopping and entertainment districts and also a major transportation hub. Famous sites here include the Glico running man image and the Kani Doraku crab image by the Dotonbori canal. Attractions include the leafy Namba Parks shopping mall, the Shin-Kabukiza Theater, and Hozen-ji Temple. Close by Hozen-ji Temple is Hozen-ji Yokocho, a celebrated stone flagged alleyway full of bars, cafes and eateries. You can download a map of the entire Minami area (including Namba, Nipponbashi and Shinsaibashi) from the Osaka Info website. 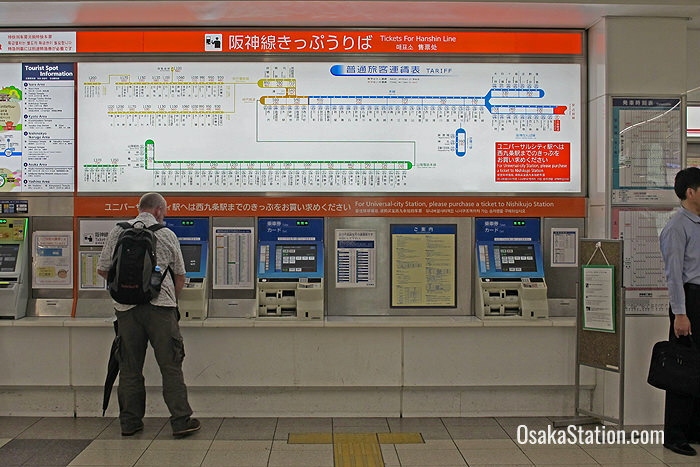 At Osaka Namba Station transfers can be made between the Hanshin Namba Line and the Kintetsu Namba Line. The Hanshin and Kintetsu railways share the ticket gates at this station and trains on the Hanshin Namba Line depart from Platform 3. Osaka Namba Station is one of four stations that serve the Namba area. The others are JR Namba Station, Osaka Municipal Subway’s Namba Station, and Nankai Namba Station. All of these stations are very close together and transfers are easily made between them. At JR Namba Station transfer to the JR Yamatoji Line. At Osaka Municipal Subway’s Namba Station transfer to the Sennichimae Line and the Yotsubashi Line. At Nankai Namba Station transfer to the Nankai Main Line and the Nankai Koya Line. The Nankai Main Line runs between Namba Station in Osaka and Wakayamashi Station in Wakayama City. The Koya Line links Osaka with the mountain temple retreat of Koya-san in Wakayama Prefecture. Transfer here to the Sennichimae Line. Dome-mae Station is convenient for the baseball stadium, Osaka Dome. There is another station nearby called Dome-mae Chiyozaki Station, at which transfers can be made to the The Nagahori Tsurumi-ryokuchi Subway Line. Transfer here to the Chuo Subway Line. Transfers can be made here to the JR Sakurajima Line bound for Universal Studios Japan (USJ) and the Osaka Loop Line. Special rail services that also stop here include the Kansai Airport Rapid Service, the Limited Express Kuroshio for Wakayama, the Kishuji Rapid Service for Wakayama, and the Yamatoji Rapid Service for Nara. Transfers can be made here to the Hanshin Main Line bound either for Umeda or Kobe. Transfer here to the Hanshin Main Line bound either for Umeda or Kobe. Hanshin Amagasaki Station is a 10 minute bus ride from JR Amagasaki Station which has lines for Kobe, Kyoto and Takarazuka as well as the JR Tozai Line for Kitashinchi. 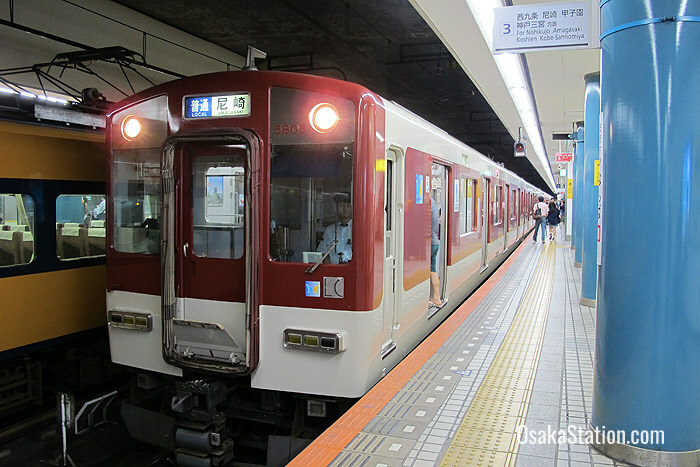 Though Amagasaki Station is officially the western terminus of the Hanshin Namba Line, many Rapid Express through services continue on the Hanshin Main Line to destinations like Koshien Station near Koshien Stadium, and Kobe-Sannomiya Station in the city of Kobe. Details of these through services are given below. The Hanshin Namba Line acts as a connecting line between the Kintetsu Nara Line that runs from Nara to Osaka and the Hanshin Main Line that runs from Osaka to Kobe. Both Hanshin Railway and Kintetsu Corporation run Rapid Express through train services between Kobe, Osaka and Nara on these lines. Here are the fares and times for some of the most popular routes on these lines. As Hanshin Electric Railway is a private company it is not covered by the Japan Rail Pass. However, various discount passes are available for travel on Hanshin lines. The Hanshin Tourist Pass is available for one day’s unlimited use on all Hanshin Railway lines at a cost of just 500 yen. Visitors from overseas can also get a Kansai Thru Pass (also called the Surutto Kansai Pass) for two or three days. This covers not only the Hanshin Electric Railway but many of the private railways, buses and subway systems in Osaka, Kyoto, Kobe, Nara and Shiga. This pass cannot be used on JR Railways however. For detailed information on all the other discount passes available for the Hanshin Electric Railway download the official guide to economical tickets. Hanshin Electric Railway have a downloadable route map of lines with the Hanshin Namba Line is colored orange. Use an English language online route finder like Jorudan or Hyperdia to check for necessary transfers and plan your journey.